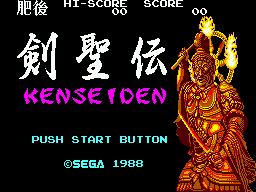 Kenseiden (剣聖伝), known as Hwarang-ui Geom (화랑의검) in South Korea, is a platform action game developed and published by Sega for the Sega Master System. The game uses the FM Sound Unit for enhanced music when running on a Sega Mark III or Japanese Master System. The player assumes the role of Hayato, a samurai with the task of defeating evil warlocks, and retrieving five magic scrolls and the Sword of the Dragon King.